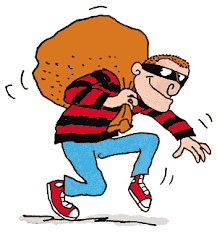 One of the crimes most frequently reported to the police is residential burglary. * Make sure all exterior doors have good locks-at least dead-bolt locks with a 1" throw. * Always lock up when you go out, even if only for a few minutes. * Secure sliding glass doors with bars or locks, or put a broom handle in the door track. * Make sure your windows have good locks, especially those at ground level. * Make sure all porches, entrances, and outside areas are well lit. * Trim any bushes or trees that hide doors or windows. * Maintain your yard and keep ladders and tools inside when you're not using them. * Don't hide your keys under the doormat or in a flowerpot. That's the first place burglars look! It's much better to give an extra key to a trusted neighbor. cameras and stereos with your driver's license number. * Keep a record of your property in a safe place. * Install an alarm system for summoning emergency help. * If you park your car outside, never leave a garage door opener in the car. * Ask a neighbor to collect your mail and newspapers, and offer to return the favor. * Put an automatic timer on at least two lights and a radio. Consider photoelectric sensors to turn outside lights on and off automatically.